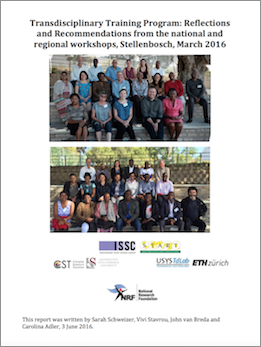 In 2014, the International Social Science Council (ISSC), START, and National Research Foundation of South Africa (NRF) brought together and supported transdisciplinary researchers and practitioners for an expert workshop to design an initiative to support and sustain capacity development in transdisciplinary (TD) research at national and international levels. The workshop was organized in response to calls from the Belmont Forum to strengthen capacity in the development, use, and evaluation of TD approaches. This increased emphasis on TD approaches in global change research for sustainability is indicative of the high degree of complexity of the problems that researchers on global change and sustainability have to address. It also reflects an ambition to ensure the relevance of the research produced, to drive science that can contribute effective and equitable solutions to those problems. It signals an aspiration to break the walls between research and society, captured in the idea of doing science with society, instead of for society.